Technology consulting group Upturn last month released a report  examining the use of predictive policing in the US and its ramifications. (Predictive policing  utilises sophisticated computer algorithms to interpret crime data and generate forecasts on future crime patterns.) The report takes a measured view on predictive policing, arguing that the strategy could ‘improve policing practices’ but the research also noted exaggerated capability claims and the potential of predictive policing to ‘reinforce disproportionate and discriminatory policing practices.’ The recommendations advocated greater public consultation and independent validation of predictive techniques to refine the strategy. The report comes amidst an ongoing debate around US policing practices , with constitutional rights violations , civil asset forfeiture  and police militarisation  the main concerns for civil society stakeholders. Queensland’s state government is looking to overhaul organised crime laws, introducing the Serious and Organised Crime Amendment Bill  to Parliament on Tuesday. The legislation creates new offences and strengthens penalties for drug trafficking, child exploitation and financial fraud . The LNP has indicated it won’t support the new legislation, meaning Labor will need the support of independents and Katter’s Australian Party to pass the bill. 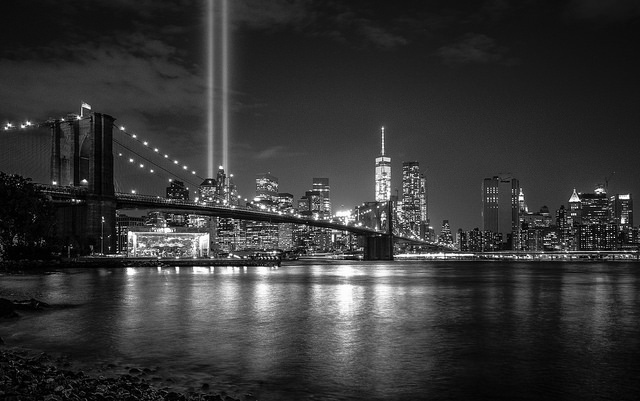 Last Sunday marked the 15th anniversary  of the attacks on the World Trade Center in New York. To mark the anniversary, several analysts  have taken stock of the West’s ongoing efforts to combat  terrorism . Despite the US$5 trillion  price tag for wars in Iraq and Afghanistan, jihadist groups remain active  across the world. The US House of Representatives unanimously passed  a bill last Friday that would allow victims of the attacks to sue the Saudi government. Despite opposition  from President Obama, there are concerns that Congress will override  a potential veto. Analysts warn the bill could weaken  norms on sovereign immunity, paving the way for citizens of foreign governments to sue the US. Philippine President Rodrigo Duterte made headlines again this week, calling  for the remaining US military advisors to leave the country’s southern region. He followed up the comments by instructing officials to buy equipment  from China and Russia to assist in combating the country’s drug and insurgency problems. Since 2002, US special forces have advised the Philippines’ military in Mindanao, where the government has fought  several Islamist groups, including the 12,000 strong Moro Islamic Liberation Front  and the Daesh-linked Abu Sayyaf Group . Following up on  UK–French border news from earlier this month , the UK will begin construction  of a wall in Calais to block migrants attempting to enter Britain via the Channel Tunnel or ferries. The wall, which will be four metres high and one kilometre long, will line each side of the highway leading into the port of Calais and cost British taxpayers an estimated £2.3 million. In other European border news, EU Commission President Jean-Claude Juncker has told  Bulgarian Prime Minister Boyko Borisov that the EU will help strengthen security along Bulgaria’s external border. Bulgarian leaders have been critical  of the EU’s handling of the ongoing refugee crisis thus far—the country shares a 259 kilometre border with Turkey and views  the refugee crisis as a top national security concern. In a change of pace, US border tensions are emanating from the north. Canadian Public Safety Minister Ralph Goodale has criticised  the US Customs and Border Protection service (USCBP) for denying entry to Canadians who admit to illicit recreational marijuana use. It’s common practice for the USCBP to bar entry  to travellers who admit to committing a crime, even if they haven’t been criminally convicted. Goodale acknowledged the US’s sovereign right to enforce border rules, but described the situation as ‘ludicrous’ and drew attention to the fact that several US states  have legalised marijuana. The Climate and National Security Forum 2016  took place on Wednesday 14 September in Washington DC. The forum featured senior retired military, defence, and foreign policy experts discussing the national security implications of climate change. The forum’s participants join several officials  who have recently sounded the chorus on this issue. Speaking to an audience in Brussels earlier this year, NATO Secretary General Jens Stoltenberg noted that climate change can cause and exacerbate conflict , ‘it can really change also the conditions for where people live, create new migrant and refugee crises and scarce resources, water, and can fuel new conflicts’. US Director of National Intelligence James Clapper, speaking at the Intelligence & National Security Summit  last week, reiterated climate change’s ability to amplify conflict  across the globe. Speaking at the 2016 Chief of Army’s Exercise in Adelaide last week, Lt Gen Angus Campbell stressed  the need for a greater understanding of Defence’s contribution to managing the consequences of climate change. North Korea has been hit by significant flooding over the last two weeks, after powerful Typhoon Lionrock made landfall  in nearby Japan on 30 August. The devastating floods have left at least 138 dead, more than 400 missing, and 140,000 in need of assistance , according to UN agencies. Deforestation and poor infrastructure has left the country particularly vulnerable  to flooding. This latest disaster adds to the country’s already dire humanitarian situation—a result of years of mismanagement , repression , and international sanctions . The country’s request for help comes as UN representatives warn  that the onset of winter may aggravate the situation and cause widespread food shortages. Neal Reddan and Edward Boettcher are ANU research interns at ASPI. Image courtesy of Flickr user Marcela.